Last summer I had decided to learn to crochet, because I heard that it was less horrible than knitting. I tried it for a weekend, and then got a full-time job, and quickly forgot about it. This Thanksgiving I had my parents bring my box of yarn, knitting, and crocheting supplies so I could try my hand at it again because I was craving some creative expression. I fell in love with crocheting. 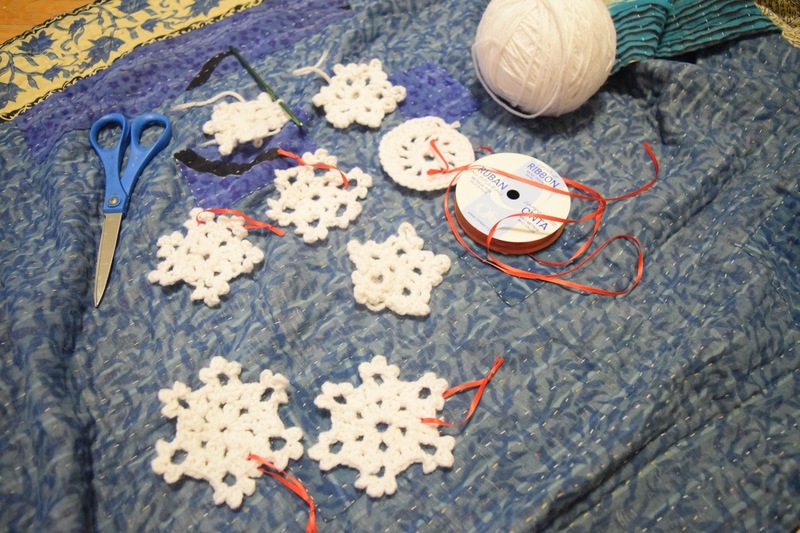 I’m working on a large grey pouf right now (but I need more yarn, waiting for a good Michael’s coupon to come out), but I also made these white snowflakes to attach to the gifts we’re giving this year. 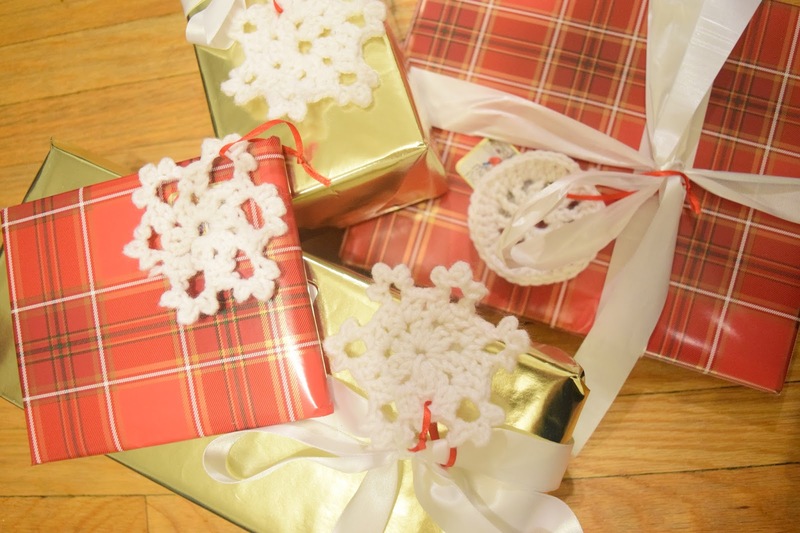 I followed some patterns and then also came up with some of my own once I understood crocheting better. I can bang a simpler one out in less than 20 minutes, so once you’re fast, it’s super easy. 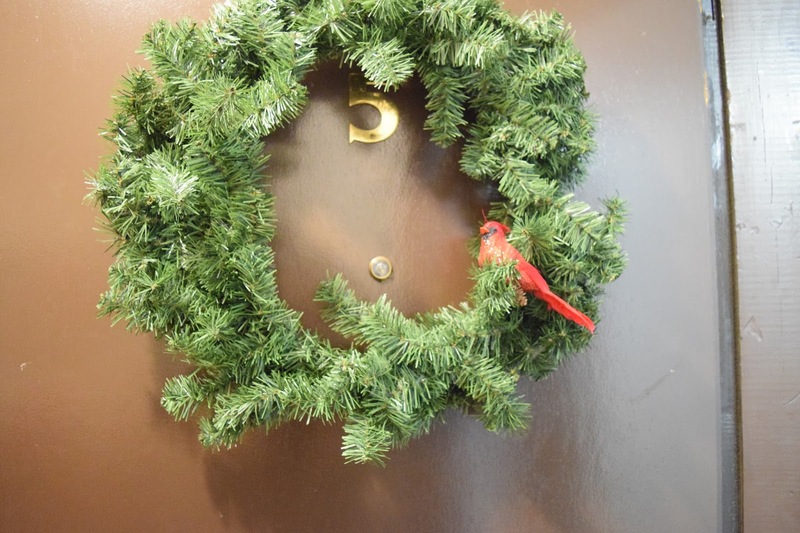 I could probably make a garland in a couple nights, if I liked garlands. The wrapping paper scheme I went for this year was red plaid (dollar section at Michael’s) and gold (IKEA). 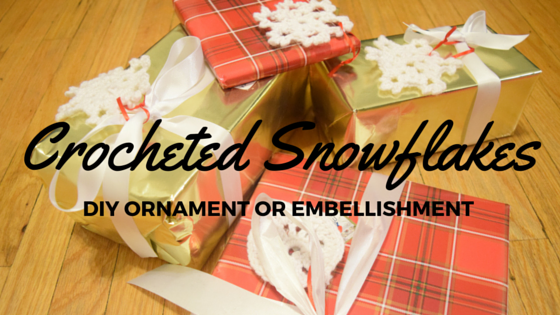 I haven’t put all the bows on the presents since we’re taking the Greyhound home for Christmas, but I’ll use that white ribbon to attach the snowflakes. Christmas is absolutely my favourite time of the year. I love the music (I’m sorely missing good church music and singing in a choir this winter), the decor, the get-togethers, the excitement of picking out the “perfect” present for your loved ones, and celebrating Jesus’ birth. 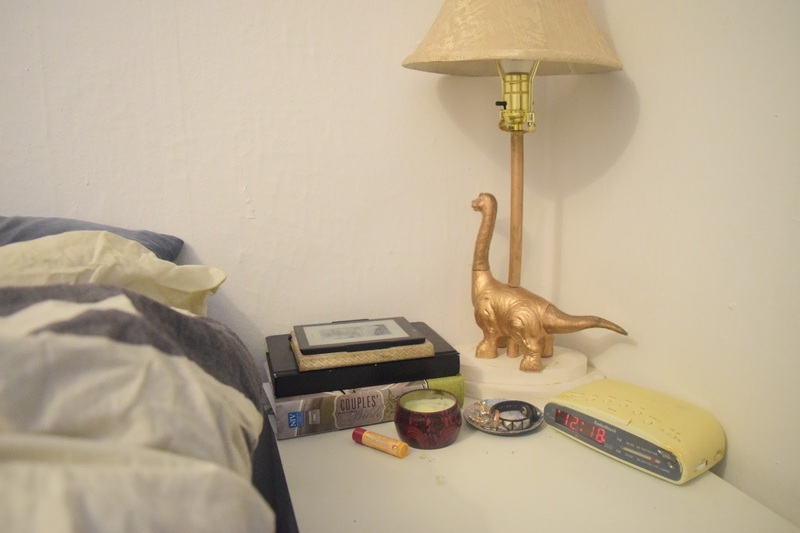 The problem is, decorating and all that stuff gets expensive, and I’m guilty of wanting things to look adorably perfect. Buy things on sale after Christmas when it’s all discounted. This is easiest if you keep a steady theme over the years instead of thinking you need to redo everything year after year. But remember that sometimes buying all the parts to make something can be more expensive than buying it. Always use coupons. Michael’s? Absolutely subscribe to it! 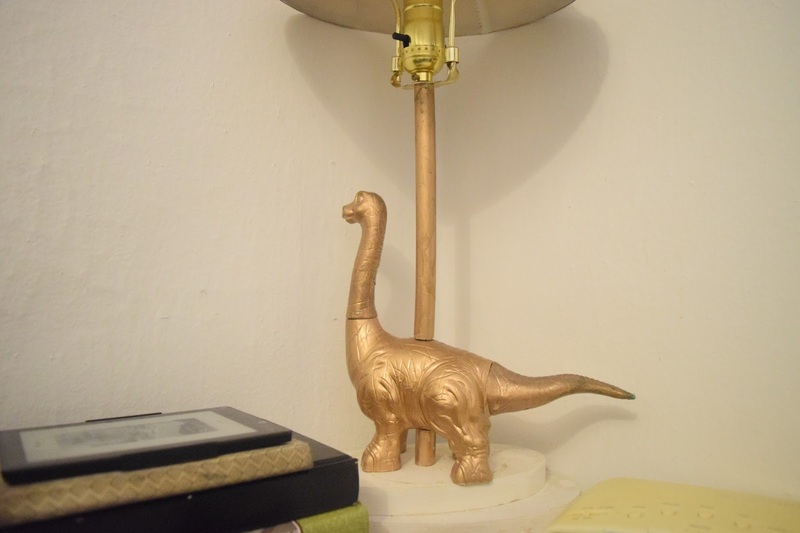 Find out if any friends are tired of their previous decor and are willing to give it to you or sell it for cheap. Plan your decor before you do any shopping, or make sure that you can return things you buy if they don’t work well together. 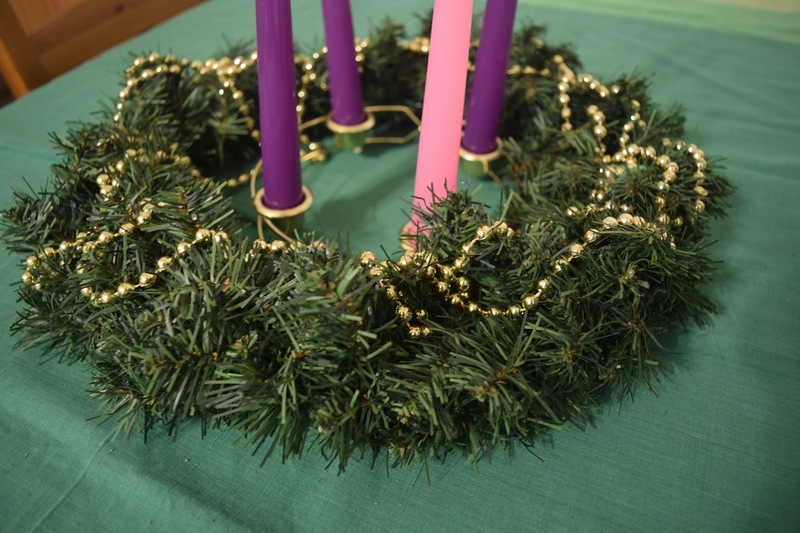 I made this super easy advent wreath for our table. The wreath and candle set are from Bed Bath & Beyond, I bought them last year when we had the ridiculous post-Christmas sales. 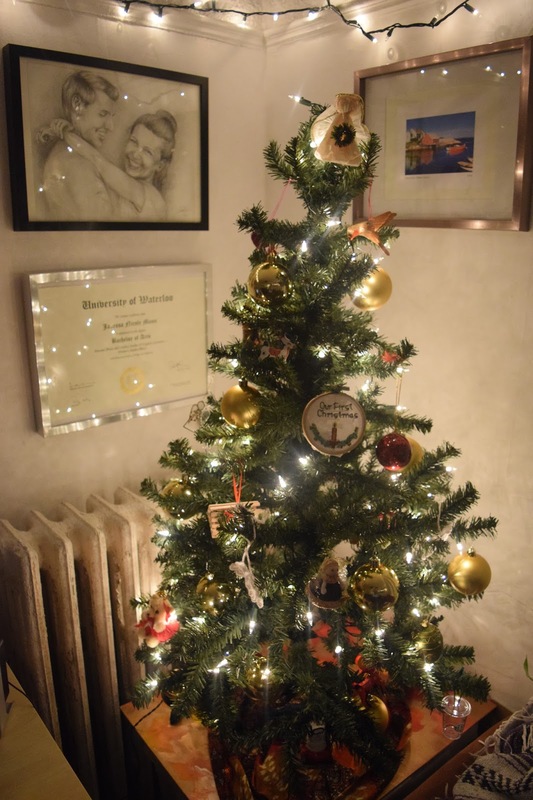 I threw on the gold beads from Dollarama which I had previously used as a garland on my tiny tree. 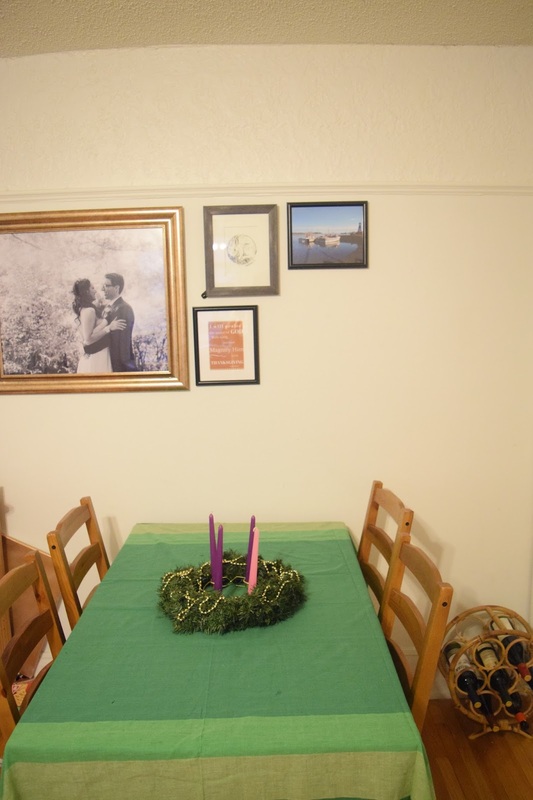 For the beginning of December, I put out this green tablecloth from Ten Thousand Villages since it’s not overtly Christmasy, but it is green. I set up this little vignette on the piano. 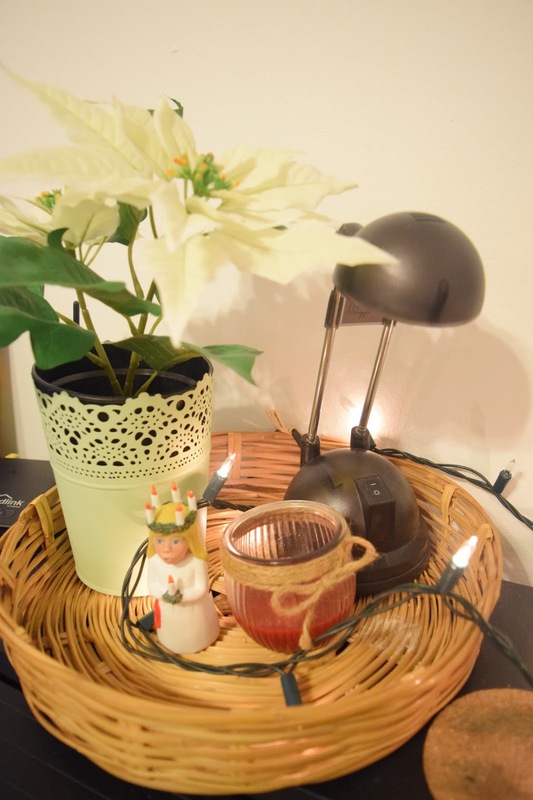 The fake poinsettia and the pot are from IKEA, the red candle is from Dollarama, and the little statuette is a gift from Sweden. For many years my youth choir performed at the Sankta Lucia celebration in Ottawa. We would sing Swedish Christmas carols, wear white robes, and hold candles in our hands. It was always a magical night. My Dad has been on a couple business trips to Sweden, so one year he brought back a little Sankta Lucia for me. She’s adorable. 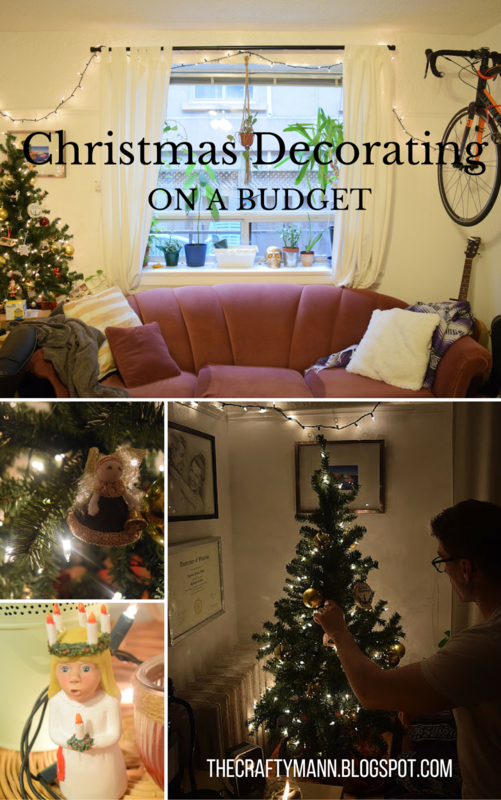 Earlier this week I posted about our Christmas tree. Despite fake trees not smelling right, not looking right, etc., you can buy them on sale, and save them for the next year. (Last year when Mom and I bought our large, real tree, it was at least $80. This tree was $25.) 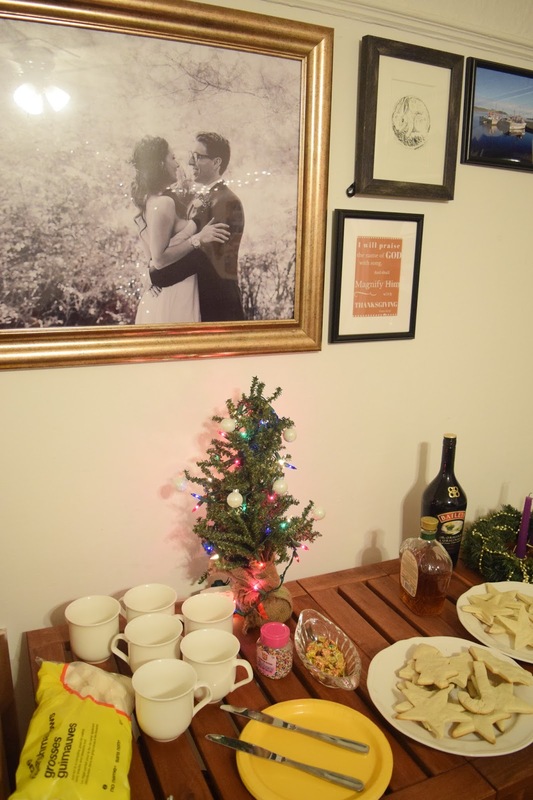 When decorating your tree, go for slowly collecting items that you can use for years and won’t go out of style. Mom gave me the gold balls, which will probably be in our scheme for a while. 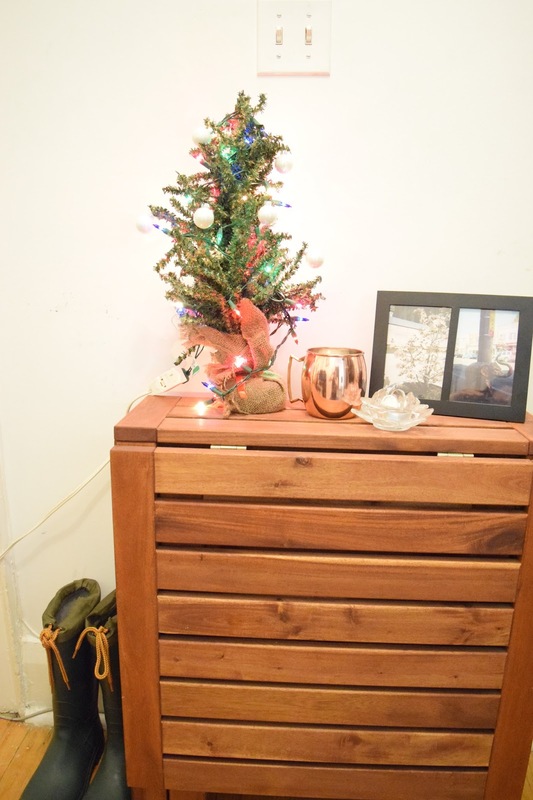 Cheap tree skirt? Put a pretty scarf down. This one isn’t warm enough for the winter, so it was great covering up the plastic base. Every year I make my advent calendar using this little tree. 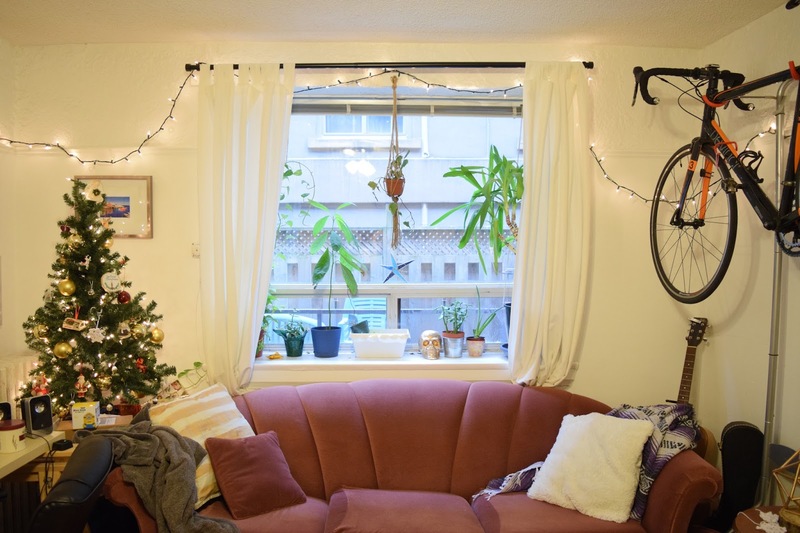 I bought a set of 24 pearly bulbs, and have been putting them up one day at a time. 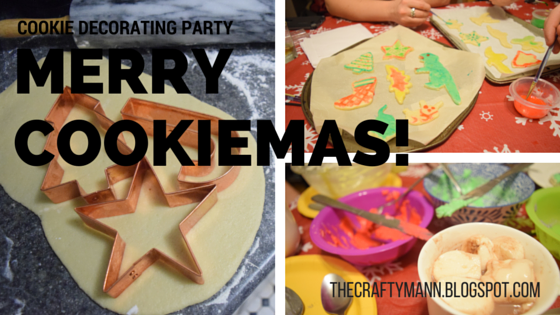 For our first Christmas, I wanted to host some sort of a Christmas cookie party. 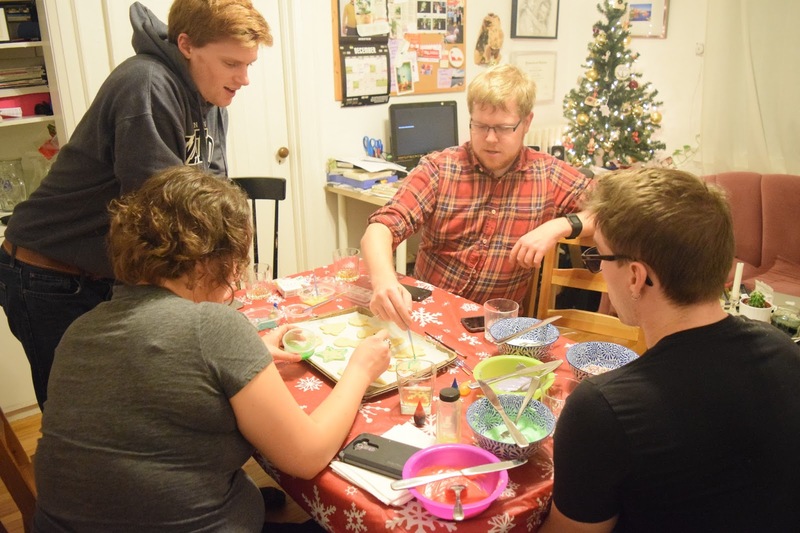 I figured for the three houses of my friends from undergrad, we should either make cookies together, or exchange them, so we have more cookies. 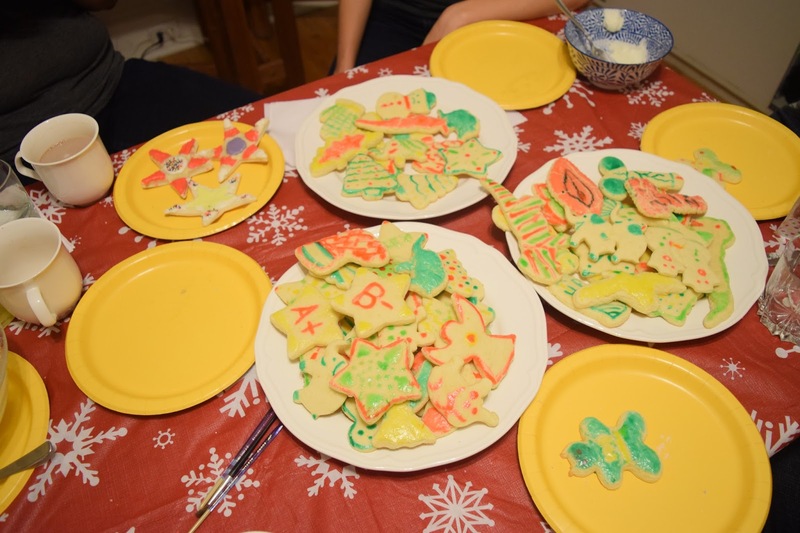 We ended up decorating regular sugar cookies, and doing Maddie’s cool egg-wash orange cookies, and splitting them up at the end. I set up our side table with the baked cookies (since Maddie was baking the orange ones in the kitchen at the same time), hot chocolate stuff, and someone even brought Bailey’s. 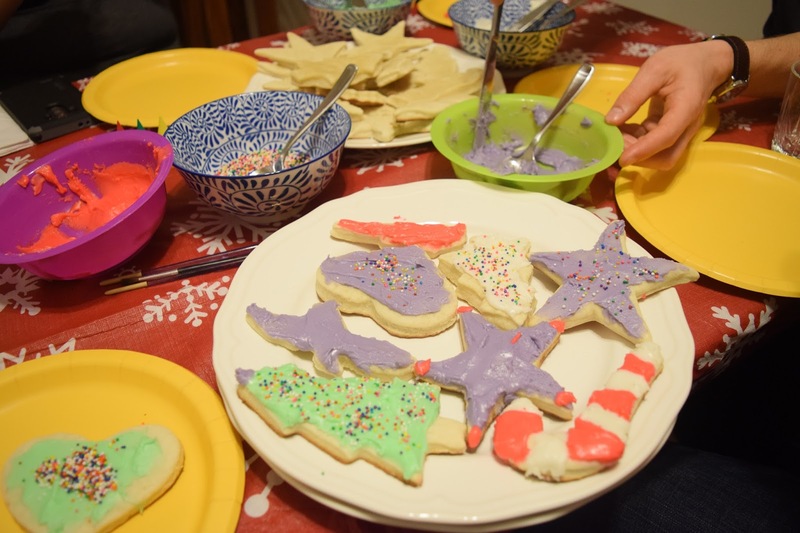 Nic’s parents lived in Zambia for a few years, and came back with this sugar cookie recipe. Nic was adament that we had to make! Cream sugar, butter, shortening, and salt. Stir the baking powder into the flour. Alternate adding milk and baking powder/flour mixture slowly. Roll out, cut out shapes, and bake at 350* for ~10 minutes. 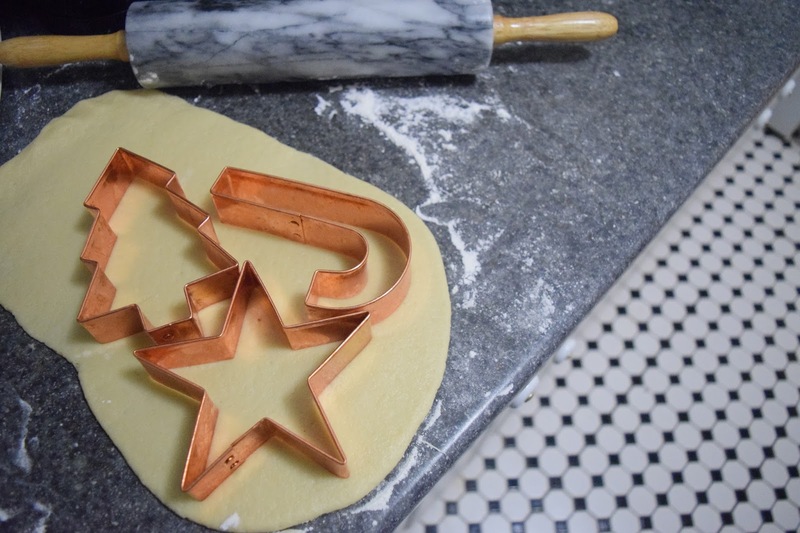 I got these stunning copper cookie cutters at my bridal shower this spring, and I love how they look! 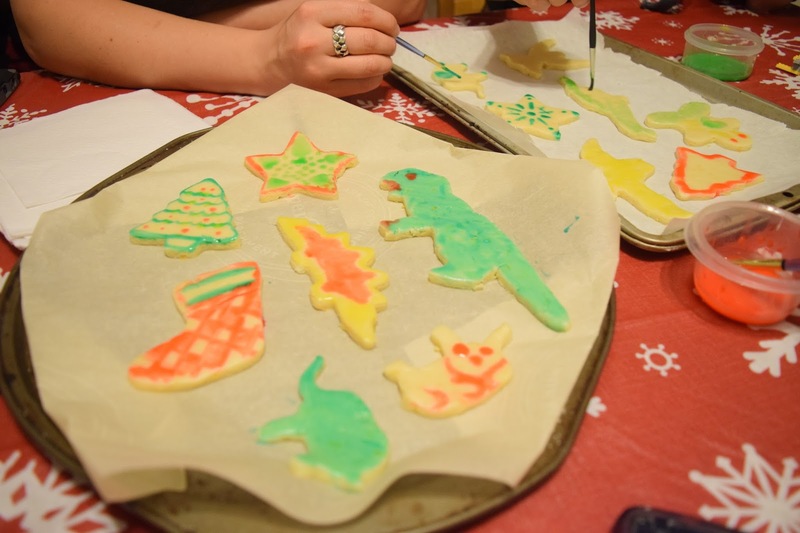 My other cookie cutters are 5 dinosaurs that I got from Dollarama. We used both. We made basic icing with butter and icing sugar, and added food colouring. Maddie really wanted to do her egg-wash orange cookies. I’d never seen these before, so it was really cool to try them. 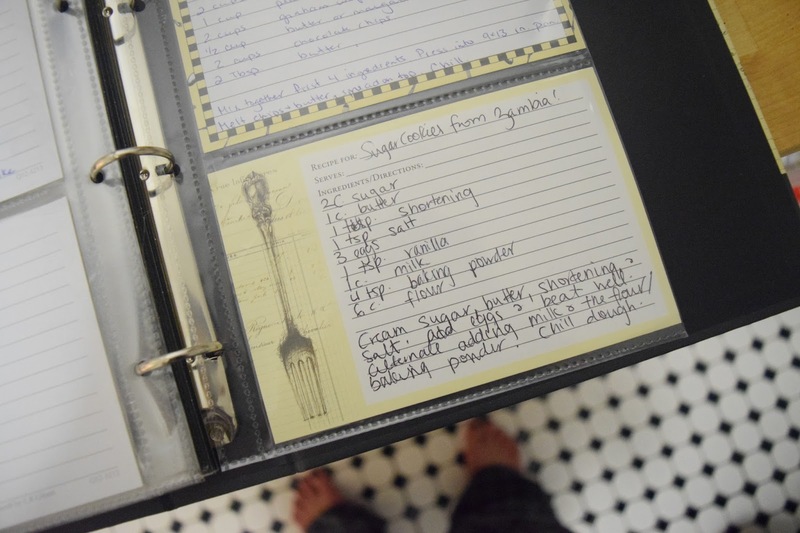 I found a recipe from Pioneer Woman that you can try out. You roll them out, then paint them with different egg-washes, and then bake them. I didn’t do a cost breakdown, but I’m pretty sure that all of us chipping in for 4 dozen + cookies was cheaper than doing it all separately. And way more fun.